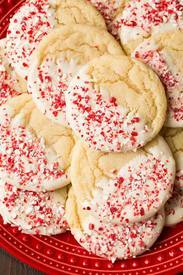 White chocolate peppermint sugar cookies! Happy National Cookie Day! During the holidays I love to make peppermint everything so I decided to come up with a festive peppermint version of a chewy sugar cookie (last year I did soft peppermint sugar cookies so I wanted to try chewy this year). What would make a cookie more festive then dipping it in white chocolate and covering it with peppermint candy?